Now spring has finally arrived, Easter is just around the corner. If this is your baby’s first Easter, you’ll no doubt want to ensure it is memorable and magical. It can be difficult coming up with ideas on how to mark this special occasion when your baby isn’t yet old enough to really acknowledge what is going on. However, there are plenty of activities and things you can do to ensure your little one enjoys this colorful and joyful holiday. 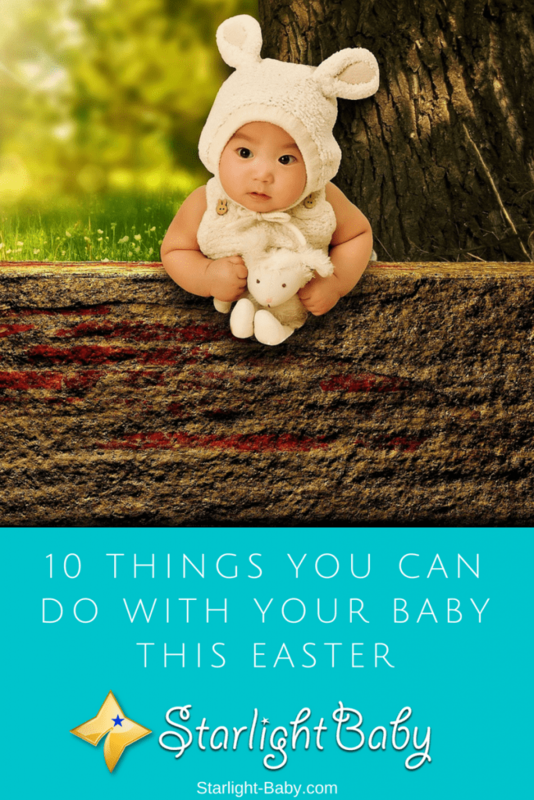 To give you a little help, we’ve compiled 10 great things you can do with your baby this Easter. Easter is typically associated with chocolate eggs, but if baby is too young for chocolate or you simply don’t want them to eat chocolate or sweets, there are alternatives available. Fill a small gift basket with baby-friendly treats such as an Easter themed soft toy, teething rings, and empty, colored plastic eggs. They’ll love having new toys to play with and you’ll enjoy seeing their little face light up when they see the Easter related goodies. Let’s face it, dressing baby up in little cute Easter outfits is one of the most enjoyable parts of being a new parent. At Easter time, you’ll find some of the most adorable little outfits designed to help you and baby get into the festive spirit. You can dress them up as a little bunny or a little chick. However, you may want to hold off joining in with the fancy dress yourself. After all, you may find your little one looks adorable dressed as a bunny, but they are unlikely to feel the same if they see you in a large bunny costume! So, if you don’t want to freak baby out, avoid getting dressed up yourself. Another great tip is to only keep them in their Easter costume for a short period of time. This is because your little one is going to find it pretty difficult to play or feed while they have large bunny ears flopping about. It’s best to dress them up just long enough to take videos or photos of the occasion. Think Easter Egg hunts are too advanced for your baby? Think again! You can easily adapt this traditional Easter game to fit baby’s skills. Choose large, colorful eggs that are going to be easy to spot. Plastic eggs tend to work better as they are safe for baby to play with. Make sure your little one is watching you when you hide the egg. Place them under obvious objects such as their blanket, or inside a large bowl. Then, help your baby find the eggs by playing peek-a-boo. You’ll be amazed just how much fun you and baby have with this modified version of the Easter Egg hunt. Make bath time even more fun this Easter and enjoy a classic game of hook-a-duck. You can purchase the hook-a-duck game online and it comes with adorable tiny plastic ducks and small fishing rod to hook them out. You may need to help baby grasp the concept of hook-a-duck, but they’ll have a lot of fun even just dangling it in the water. You can even give it a go yourself, purely to show your baby what to do of course! Christmas isn’t the only time you can create your own annual traditions. This Easter why not create a sentimental keepsake which can be used each year? Some good examples include creating a wooden Easter plaque with your baby’s name on, or you could even create a little Easter painting using your little one’s hands and feet. Keepsakes make future Easter celebrations even more special and you can pass them down to your baby when they are old enough. Babies love stories, so why not indulge them this Easter and put on a real-life story complete with Easter themed finger puppets? These colorful puppets will really grab baby’s attention, and if you put on fun, cartoon style voices, you and baby will have plenty of fun. Baby may not be able to walk and talk yet, but one thing they do very well is observe. Easter parades are a fantastic activity you and baby will really enjoy. They’ll be mesmerized by the large floats, bright colors, and loud noises. However, it’s also easy for your little one to be overwhelmed, so it’s best to pop along for half an hour to an hour and read baby’s cues to see when they’ve had enough. If your baby is around 12 months old, Easter cards are a great activity you can partake in. Use your little one’s handprints to decorate the back of the cards, using different colored paints. The front of the cards can be decorated with colorful Easter images. Once the cards have been created, you can use them for simple games such as match the images. You can make it easier to find matches by ensuring you use the same colored handprints on the back of two matching images. You don’t need to venture out to enjoy some Easter festivities. Why not hang Easter themed decorations on the walls? You could also invest in an Easter related mobile, keeping baby mesmerized while they’re in the crib. Decorating the home is a simple, yet very effective activity your baby will enjoy. Baby’s love soft toys and Easter is a great time to find adorable bunny and chicks. This is an inexpensive, yet great way to celebrate the occasion if you have a newborn or younger baby. Overall, there are plenty of ways you and baby can celebrate the upcoming Easter Holidays. Do you have any additional ideas? We’d love to know what you and your little one are up to this Easter! Even though that we already passed this year’s Easter I really enjoyed reading this and reminiscing about all of the things we have done this year. I always love holidays because it gives you extra time to spend with your family. This year was one of the best so far because he is finally old enough to do way more activities. What we did was, we took him to his grandparent’s house where my mom hid three baskets full of candy around her house. We told him that if he finds them he can keep all the things inside. You can imagine how fast he wanted to start, haha. We were pleasantly surprised by how fast he found all three! Then in the afternoon, we painted some eggs together. We gave him one of those fingerpaints and different Easter stickers that he could use. He really loved decorating the eggs. I think it is a great activity but it also lets the toddlers express their creativity. Overall, it was an amazing Easter. I will note some of your suggestions for next year. I especially want to try to dress him up as a cute bunny. I don’t celebrate Easter as I am not a Christain. I am a Hindu and recently, we celebrated the Hindu festival of Diwali. Had I read this article prior to Diwali, I would have used some of these ideas. Creating a (Easter) basket and play dress are very good ideas that I can use for any occasions. Every Christian parents out there loves it when Easter is around the corner, it comes with lots of celebration and activities that are pleasing to both the kids and the parents as well. Personally, I’m more taken with creating of Easter baskets and Easter egg hide and seek. These thrill my little ones a lot that I never deny them such whenever Easter is on for celebration. The decorating of homes with them is what we do at the later hours which they also enjoy participating in as well. These are very interesting things to get into with one’s baby during this coming up Easter season. I always love going to Easter parade and I’m definitely going to take my family to the one being held this season as long as the weather is clear enough without any rain. I wouldn’t want to put my little ones to health risk of cold flu. I will be looking at engaging my baby with the Easter hunt egg of hide and seek this season. I haven’t tried this before, so I’m looking forward to having a wonderful experience with doing it and hopefully my baby would enjoy it as well.